My husband had my vehicle that day and a trip to the Dr. would involve a ride in his rattly old pickup truck, waiting, and then a second trip for a scan of my back. Walking and standing brought real pain and the thought of such a trip was overwhelming. Instead of heading to the Dr., I pulled out all of my back care tricks. I rubbed pungent Tiger Balm on my clenched muscles, wrapped my brace tight and threw back 1000 mg. of Ibuprophen. Then, I laid down on the floor, flat on my back, which seems to be one of the simplest ways to relax and realign my muscles. This is what I know I need to do when my back gets bad. But there’s so little I can do in that prone position. I can’t write, can’t be online, can’t clean, cook or do laundry. I can read for brief periods of time until my arms grow weary, I can scroll through Facebook on my phone. It’s humbling, it’s frustrating. But I laid on my back as much as I could on Wednesday, I took a two hour nap and did slow, gentle stretches. By Thursday things were a little better, by Friday another bit improved. Every time this happens (once, twice, three times a year?) I think, “I have to work on my abs, my back needs more support. It wouldn’t hurt to lose a little weight either.” But these thoughts arrive at a time when I’m in too much pain to embrace them, by the time I’m up and able I’m too busy with life to make good on my own commitments. I’ve heard a lot of talk about healing this past week in the wake of the election. “The time for arguments is past, the time for healing is begun,” the rhetoric goes. I believe that’s what we heard four years ago too and four years before that also. Yet we continue to run ourselves, every four years, through a gauntlet of vitriol, hate and ideological (as well as actual) violence. I'm not surprised that the nation of America is trapped in this cycle, but I'm dismayed that the church in America is also. Something about this repeated cycle tells me we’re not really that interested in healing after all, but more interested in rearming and preparing for the next round like boxers gasping for breath, dripping sweat in the corner of the ring between rounds. How often can we keep repeating this injury before the whole body is beyond repair? How long can we limp along? Despite chronic and sometimes debilitating back pain for ten years I don’t take muscle relaxers because I need the pain to tell me to make a change. Maybe it’s time we as a country starting listening to our pain and the pain of those around us. Maybe it’s time we stop rushing to heal when we’ve yet to identify the wound, to cleanse it and seek amends. Maybe its time the church took the lead in this activity. The prophet calls creation to bear witness against the people of God who, though reared by God have become “utterly estranged.” I love the prophet’s use of image after image to convey the absolute discord between what is and what should be. According to the prophet, the people of Israel lack the basic common sense of an ox or donkey, they’re utterly tone-deaf, wracked with delusion. Isaiah is addressing the nation of Israel – God’s people - and so the accurate parallel to us is to hear this as a word for the church, those who identify themselves as the people of God today. What I hear in this passage is a pleading, lovesick God seeking to speak sense into a people who no longer see, no longer comprehend the peril of their situation. I'm convicted this week by my own failure to comprehend the reality of my situation physically in regard to my aching back. And I’m prayerfully wondering the degree to which I should feel convicted of a failure to understand the reality of my situation spiritually, by which I mean, as the prophets always meant – in regards to righteousness and justice. Isaiah isn’t asking people to come back to church, in fact a few verses down he slams their religious practices altogether. He isn’t asking them to pray more or attend Bible study more faithfully. God, through the prophet, is calling people to a faith that bears fruit in the arenas of justice and righteousness, particularly on behalf of the poor and marginalized as Isaiah 1:17 makes clear. This week has revealed the depth of my back issues, I would be foolish to continue to ignore them just because they lessen for a day, a week, a month. This election has revealed the depth of our issues as a nation, but more importantly as a people who claim to seek God’s face. We would be foolish to ignore them even if they lessen for a day, a week, a month. Let us not hurry toward healing that is merely hiding. Let us listen to voices around us, but particularly those of the poor, the weak, the marginalized. 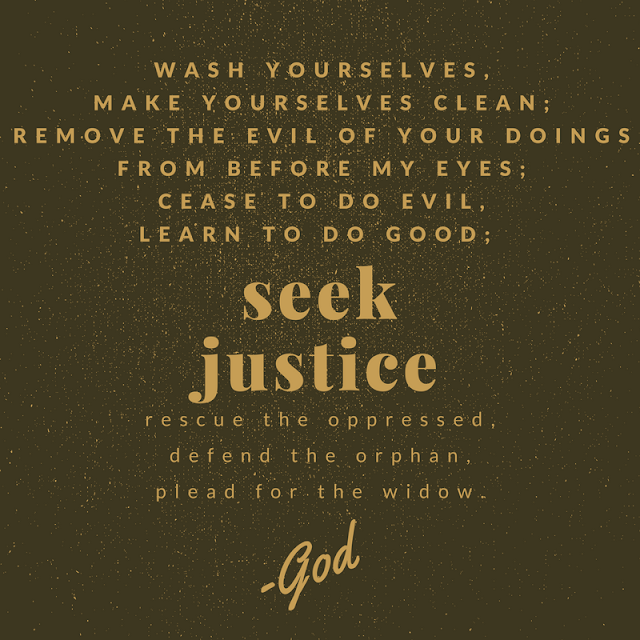 Let us pray and examine our hearts, where is our own justice, our own righteousness lacking? Let us seek to love not merely in words, but in deeds. Thank you to everyone who participated in the Rafflecopter last week. The winners of a free copy of "Chicken Scratch: Stories of Love, Risk & Poultry" are (drum roll . . . ) AMY HERTZLER and JACOB LONG. Congratulations! I'll be emailing you soon for a mailing address. So strange to read your post -- I had the same thing happen to my back this week as well. I think of my back as my "release valve" that tells me I'm either over doing it, or I'm stressing about something. It tells me to listen and to slow down. Not at all fun, but so needed. Hope you're feeling better every day. I do hope you are doing better and have found relief for your pain. May we constantly take stock of our hearts so that we fulfill the command of God to love not merely with our words but that our deeds would speak love more loudly than any words we could say. Blessings! oh back issues can be so very painful! I also echo the meaning of your words about the church and the election..I'm sure God grieves..blessings, hope you feel better. Yes, this is it: "Let us listen to voices around us, but particularly those of the poor, the weak, the marginalized. Let us seek to love not merely in words, but in deeds. " Thanks, Kelly! I hope you're feeling much better by now, Kelly. Except for God's direct intervention, believers are the only ones that influence any lasting change for good in this world. Your words are worth sharing. I pray they will influence all who read them. I downloaded your book this weekend - looking forward to digging in!